Radamenes might look like your ordinary cat, yet he is anything but. In fact, he has an extraordinary gift – the capability to comfort and even heal other animals! 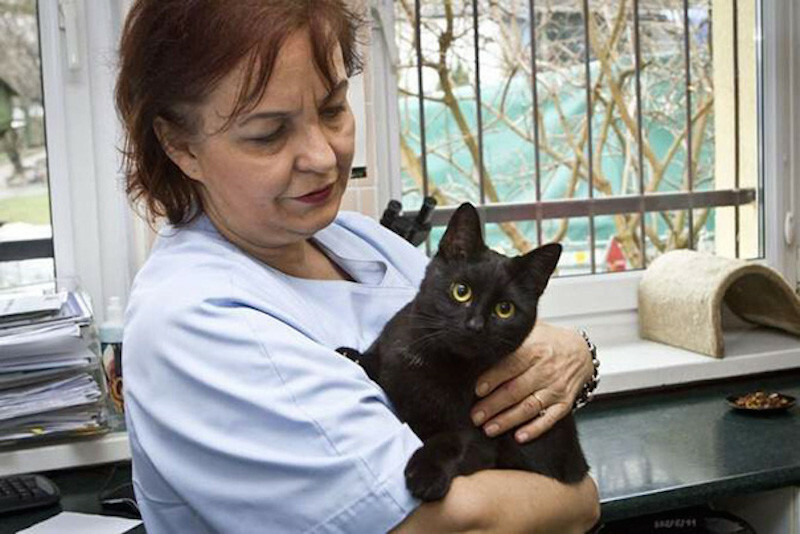 This special cat was initially brought to an animal shelter in Bydgoszcz, Poland because he was in dire need of help. Due to a severe respiratory infection, this poor kitty was literally on the brink of death, and rescuers were not very hopeful. Luckily, Radamenes managed to beat the odds and made a truly remarkable recovery. He has an extraordinary gift – the capability to comfort and even heal other animals. After he got better, the staff at the shelter began to notice his helpful nature. So, although they typically try to find a happy home for their animals, they actually decided to keep Radamenes for themselves. Happily, he has been assigned the ‘duty’ of being a “nurse cat” at the shelter. That of course means he now spends his time nursing other needy animals back to health. Given his natural ability for comforting sick and injured animals, Radamenes voluntarily spends his days nestling up with sick and recovering animals. He soothes them with his soft purring and hugs. Cats are basically known for being loyal animals, and Radamenes is certainly no exception. He’s a true friend to the end that’ll be there for the other animals through good times and bad. He soothes them with his soft purring and hugs. Numerous studies over the years do reveal that touch definitely has the power to heal. Caring contact can often help the sick or injured recover much more quickly. That’s why Radamenes cuddles and kisses his furry friends until they recover! Caring contact can often help the sick or injured recover much more quickly. That’s why Radamenes cuddles and kisses his furry friends until they recover! Since his angelic arrival, Radamenes has made many miracles happen at the shelter. He has helped countless animals recover and survive their illnesses, yet he never expects anything in return. Yes, this is one cat that couldn’t care more about others – who we can all take a cue from! If you love Radamenes as we do, feel free to share the story to spread love around!